Coraline - The best family film of the year? Over the weekend I took my children to see Coraline (in 3d) at our local cinema. Now as anyone who's read Glamumous for some time would understand, I don't usually review films on this blog (books yes, but never movies). However, we were all so blown away by Coraline that I simply had to write about this here for any other mums who've been hesitant about seeing this amazing film which I believe is truly best experienced in 3d. Based on the novel by the British author, Neil Gaiman, Coraline is the story of a young girl who stumbles upon a magical, parallel and seemingly perfect world where everything she wishes from life becomes a reality. Whereas her real parents barely have time to talk (let alone play) as she explores her new home in the Pink Palace, in the other world, her "other mother" spends time baking cookies and delicious meals to entice her, while her "other father" lets the piano play him (no kidding) and takes rides on a magical mantis in their living breathing garden. However, all is not as it seems. When her other mother wants to keep Coraline in the other world, Coraline is set to battle with all her wits (and the aid of a wise talking cat) to save her soul and free the ghosts of children trapped in this realm. I don't want to give the story away since this is a film you really must make the time to see, or rent on DVD as soon as it's released! Despite being marketed as a kids movie, Coraline is rather sinister and I doubt it's suitable for young or sensitive children as some scenes offer the potential for nightmare material in little minds. Having said that, my four year old daughter positively adores this film. I was a little apprehensive (having seen some of the trailers for Coraline) and at times she was a little edgy, but the sheer magic of this wonderful film won her over. To summarize, Coraline is "handmade" - the attention to detail is exquisite, and once you realize that the sweaters and those mittens from the clothes shop are actually knitted in miniature by a real person, you'll understand even more what makes this film so special. I'd certainly recommend this, and believe this is definitely the best family film of the year (if not the past five years). If you loved The Nightmare Before Christmas or James and the Giant Peach, this will truly be a film you and your family will love. Just be sure not to take very young children, and if in doubt, visit the official website to get a glimpse of what Coraline has to offer. For those who do stay to the end of the film (as I always do! ), you may well wonder what "Jerk Wad" means to "those in the know"... I sincerely doubt Henry Selik intended the meaning offered by The Urban Dictionary for this phrase! Instead, this was a password which could be used in Coraline's room on the official website to enter a competition for a pair of Nike trainers. Sadly the competition is now closed, and as far as I can tell there is nowhere else on the site to enter this curious phrase, but if you were burning with curiosity at least you now know what it means. 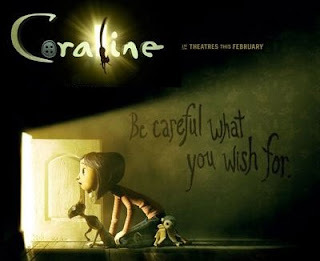 Here's one of the best trailers I've found for Coraline, in fact, the one which made me book tickets so we could see this film the very same night. Enjoy, and if you do watch in cinema 3d, be sure to leave a comment and let me know what you think too.